My name is Phoenix, but my friends call me Finn. I was born in Saanich, BC on April 14th, 1998 to the Yager family where I lived with my siblings until the Fryias adopted me. Now, I live with my annoying little brothers Rocket and Chum, sister Speck, and our humans Brian and Joanne. 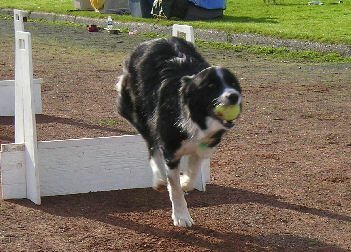 I got into flyball with Joanne because she was looking for something exciting to do that would put my mind to work as well as my body. 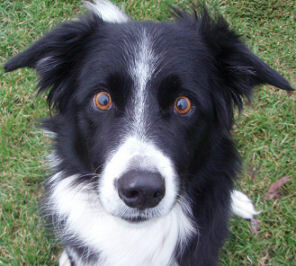 Being a border collie, I am naturally a very intelligent dog, so flyball is a great way to keep me stimulated. I have a beautiful smooth turn, and I'm very reliable on the course. I had a few challenges with passing after a collision, but I'm pretty much over that now. I started training in April 1999 and ran my first tournament in September 1999. It's been a lot of years since then, and while I used to clock about 4.1s on a regular basis, now I usually run around 4.8 seconds. In addition to the flyball titles, I have my Canadian Canine Good Citizen (CCGC) title - that's where they test you on how well you listen to your handler in different situations, and I am a Pacific Animal Therapy Society dog, so I get to visit people in retirement homes and hospitals. I'm also into agility, and when I'm not 'working', I like to chase butterflies and play in the water. I love food, and my favourite toys are the squeaky ones. And I love learning new things, so Joanne has taught me lots of tricks: I can find lost or hidden items - I'm especially good at finding keys; I can turn lights on and off, and even retrieve a carrot from the fridge. Can you believe that? - they taught me to open the fridge! Who is training who? !